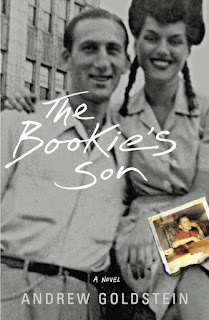 One-sentence summary: In the summer of 1960, Bronx-native Ricky Davis confronts his father's involvement with the criminal underworld when he tries to earn enough money to pay of their family's debt. Do I like the cover? : I do -- it was designed by the author's son and is quite evocative of the novel's mood, setting, and family focus. First line: The day started uneventfully. Am... I in swoons over discovering a new publisher? : YES -- especially because this is, I presume, a local press. 617 is the area code for Boston and I'm tickled by their name! Buy, Borrow, or Avoid? : Borrow or buy if you like NYC as a character, strong family narratives, coming-of-age stories, and conflict over family and loyalty. Review: This is a devastating novel of a place, and an era -- the Bronx, 1960s -- and a young man's coming-of-age among horrifying violence. Ricky Davis, facing his Bar Mitzvah, has a crush on a Catholic girl in his building. His father, a dress cutter and part-time bookie, owes money to a local mobster, and one mistake after another leads to the family spiraling into real danger. Ricky wants, of course, to make things better. He loves -- and fears -- his passionate, beautiful parents, a striking couple meant for better things, perhaps, but caught by real life. He tries to figure out how to make enough money to pay off his family's debt to the mobster so his parents can be happy again. He's encouraged by his rabbi to meditate on what it is to become a man, but Ricky faces challenges most adults don't have to grapple with. Goldstein's writing is brisk, evocative; I raced through this book -- cringing, at times, because of the violence featured or sexual experiences of young Ricky (neither of which are gratuitous, and feel appropriate to the story) -- because I wanted to know how the Davis' would survive. At the heart of this book is family, and despite their dysfunction, Goldstein made me love them. I'm thrilled to offer a copy of The Bookie’s Son to one lucky reader! To enter, fill out this brief form. Open to US/Canadian readers, ends 10/5. This really is a great cover and I do enjoy NYC as a character and who doesn't like a good coming of age story? The cover is marvelous -- it just captures Ricky's parents -- the idea of them, at least -- and NYC is so present in this story. Both NYC and the Catskills. You totally should get this! I read this one too, and was totally gripped by the story. It was a mature story for sure, but I was so involved with just what was going to happen with the family, and above all, I just wanted Ricky to be alright. You described it perfectly when you called it devastating! Excellent review today. Mine will be up this week as well. I didn't expect to like this one as much as I did -- I'm not wild about the '60s nor stories featuring guys -- but in this case, Goldstein made me care! The ambiance and events were just so real, so striking -- I couldn't put this down. Can't wait to see your thoughts! I'm fascinated with the criminal underworld for some odd reason so this sounds good to me. Then you'll enjoy this -- because it isn't romantic at all -- horrifically real (enjoyably so! what does that say about me?!). Wonderfully done. I don't think this is my thing at all, but I'm glad you liked it. As always I marvel at your ability to pick just the right words! There's something so fascinating about places becoming characters in and of themselves, but I doubt I know enough about New York to really appreciate that aspect. Also, since this is a small press, I suspect I would have trouble locating a copy of this to read from the library. Christina -- you're so kind! Thank you for saying so. Definitely, this is the kind of book for a particular reader or mood -- and in this case, it worked for me even though on the surface I thought I'd be 'meh' on it. I really enjoyed this book too Audra. I love stories like this and even more knowing it was based on truth. It had the feel of an autobiographical novel, which I always enjoy! I have heard lots of pretty good things about this book, even though the topic doesn't totally sound like something I would normally find interesting. But you've made it sound like something I should try! Jenna -- I'm with you -- it's not the kind of book I'd pick up if browsing, but I'm glad I did read it -- it has the wonderful gut punch of a great coming-of-age novel. I like this cover as well...and the book sounds just as gripping. Yay for discovering a new (and local) publisher!!! What an unexpected treat!